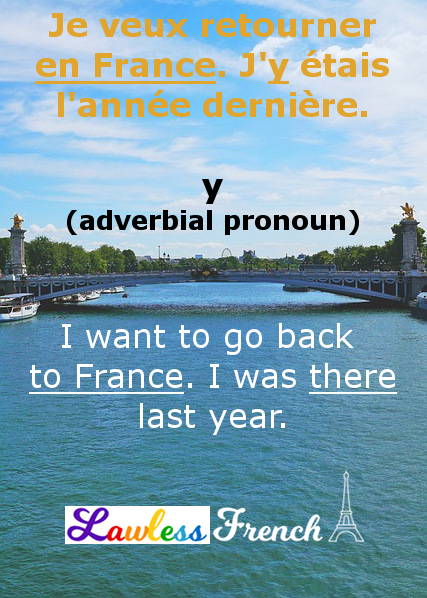 The adverbial pronoun y can replace a place or the object of the preposition à. Y is most commonly equivalent to "there," but may also be translated by a preposition plus "it." Nous allons à la plage. Alix nous y attend. We’re going to the beach. Alix is waiting for us there. Le travail sera terminé, tu peux y compter. The work will be done, you can count on it. Y most often replaces a preposition of place, such as à, chez, dans, en, or sur, as well as the place itself. Je veux retourner en France. J’y étais l’année dernière. I want to go back to France. I was there last year. Il est chez le médecin, il y va le mardi. He’s at the doctor’s; he goes there on Tuesdays. J’aime la France, j’y vais chaque année. 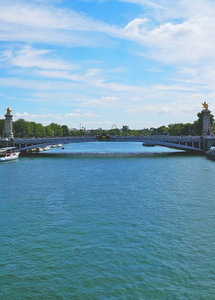 I love France, I go there every year. In English, you can say "I’m going!" and no one will bat an eye. But in French, Je vais ! is not enough; the person you’re talking to will be waiting for you to finish your sentence. If you’re not going to specify the place, e.g., je vais en France, you have to say j’y vais. Y is also used with verbs that require the preposition à plus an indirect object. Je pense à ta décision. J’y pense tous le temps. I’m thinking about your decision. I think about it all the time. Répondez au téléphone, répondez-y ! Answer the phone, answer it! I though the explanations of kwiziq were good but the ones on this site are honestly even better. Whenever I don’t quite get something on kwiziq now, this is my first stop! Merci Michelle 🙂 Bonne continuation ! This is the clearest and best explanation of the adverial pronoun “y” which I struggle with when speaking. And I love how the all the lessons are chort and to the point. They aren’t condensed with too much information. As a French major in college, I rely on these helpful lessons to give me a better understanding of subject material that I’m learning in class. I love this website! Merci beaucoup! This is the first satisfactory explanation I’ve seen of “y”. Merci! You’re by far the best describer of French for gringoes on the planet. We await the follow-on of Intermediate..Dummies eagerly, millions of us.